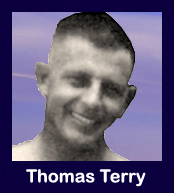 The 35th Infantry Regiment Association salutes our fallen brother, SFC Thomas L. Terry, who died in the service of his country on July 4th, 1967. The cause of death was listed as Helicopter Crash. At the time of his death Thomas was 38 years of age. He was from Ansted, West Virginia. Thomas is honored on the Vietnam Veterans Memorial at Panel 23E, Line 008. The decorations earned by SFC Thomas L. Terry include: the Combat Infantryman Badge, the National Defense Service Medal, the Vietnam Service Medal, the Vietnam Campaign Medal and the Vietnam Cross of Gallantry with Palm Unit Citation. SFC Terry was a member of A,1/35th from January 1967, to late April 1967 when he joined the Special Forces. SFC Terry and SFC Marlin Goodhue were with SOG Surveillance Team New York and aboard a SV helicopter after extraction from Laos. This chopper collided with another while enroute to Kontum City, all aboard were killed. SFC Terry served in the Korean War with the 7th Infantry Division and was awarded a BSV there. Just received your wonderful letter a few minutes ago. Thanks for writing to me. Annette, I would love to have a frog but I haven't a place to keep it over here and it might get mixed-up with all the little frogs over here, and then I couldn't tell which one was mine. So if you get a pretty one, keep it for me until I get home, OK? There is a boy in my Company who has a monkey; boy Annette, this monkey is mean! He takes anything he can get his little hands on. What I want you to do is answer this letter real soon.....please hurry. Well Annette, I will close for now and try to answer your sister's letters. Be good and answer soon stinkpot. "I will continue my search and will always be proud and thankful to you and everyone who served and died for our country, Special thanks for your Cacti Brothers for honoring this page in your name. If anyone was his friend, feel free to contact me. Would love photos or stories. Thank you and God Bless."